Union Pacific Corp. operations are about 80% of normal, after it deployed more locomotives and crews to clear network congestion that began eroding service last year, CEO Lance Fritz said. The railroad has reduced the number of cars on its network by 13%, helping to increase train velocity and reduce the time equipment sits at switching yards, Fritz said. Bottlenecks had caused the number of equipment on its tracks to reach unacceptable levels. “The cars on the railroad are down dramatically, and we still have more work to do,” he said May 23 at Bloomberg’s headquarters in New York. Fritz’s comments signaled that Union Pacific is struggling to get its efficiency to the same level as Canadian operators. Its operating ratio, a calculation of costs as a portion of revenue, was 62% last year — the best among U.S. railroads. But the figure, for which a lower number is better, rose to 64.6 in the first quarter because of the congestion problems. 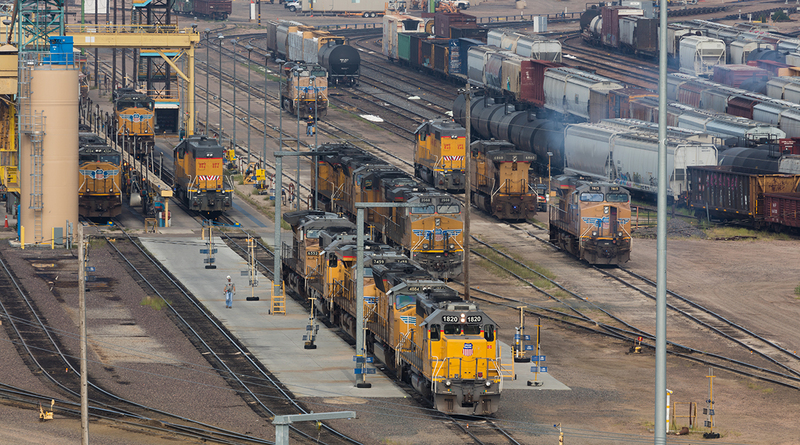 Union Pacific previously said that the costs of hiring crews and deploying additional locomotives mean it won’t meet a goal of achieving an operating ratio of 60% by the end of next year. Fritz said he will address the target’s timing at an investor meeting May 31. The traffic jam started last summer with the installation of Positive Train Control, a federally mandated safety system that can stop a train automatically to prevent an accident. Initial uses of the system halted trains unnecessarily. Disruption from Hurricane Harvey in August exacerbated the congestion problem, and Union Pacific wasn’t quick enough to address the surge of rail cars, Fritz said. “Where we missed the boat is we weren’t aggressively monitoring and taking action as inventory built up,” Fritz said. While next year’s goal for operating ratio will be pushed back, the long-term target of 55% remains, he said. To reach that figure, Union Pacific will “have to look different” than it does today, Fritz said. Fritz also will discuss at the investor meeting how the corporate tax breaks passed by Congress will affect Union Pacific’s ability to add debt capacity while maintaining its credit rating. The railroad has said that cutting its federal tax rate to 21% from 35% will add about $1 billion to free cash flow this year.